Yes, awesome, inspiring feelings of awe; magnificent, amazing, stunning. Math rocks! I truly enjoyed creating Untied, with its free-form, no math construction. Though I used a ruler for parts of it, it wasn’t because the outcome depended on the measurement. Instead, at those instances I was only interested in straight, and sometimes parallel, lines. However, I love the challenge of a technically difficult quilt, too. For a change of pace, I began a brand new project. The inspiration for it is a piece of fabric I bought several years ago. It’s a fussy historical print that I’ve always loved. However, it’s fussy and historical, and the colors are just off, all of which have made it hard to use. 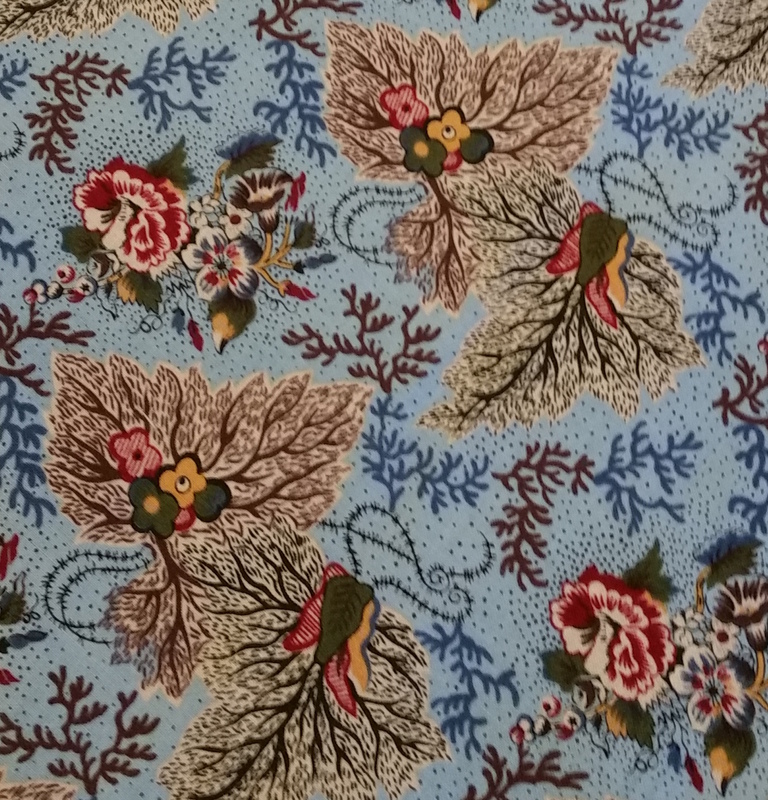 If it is cut into small patches, the impact of the print disappears, but large pieces would require designing just for it. So I am. I started by pulling from stash, which is how almost all my quilts begin. I pulled all the blues that could work with that print, which meant they had to have a tinge of green and a little grey. It’s the color I learned as French blue. As it turns out, I don’t have a lot of blue with that, and all of it is in scraps or small pieces, other than the inspiration print. We’ll see how far I get before needing to buy something. Burgundy reds, creams, browns, and cheddar oranges also came out of stash, including from my scrap drawer. I’m trying to commit to using my scraps more effectively. They come in handy, as I’ll explain later. What a great way to quickly increase the size of a quilt! After trimming, I added a 1″ border all the way around, taking it to 38″ square. That’s an odd size. 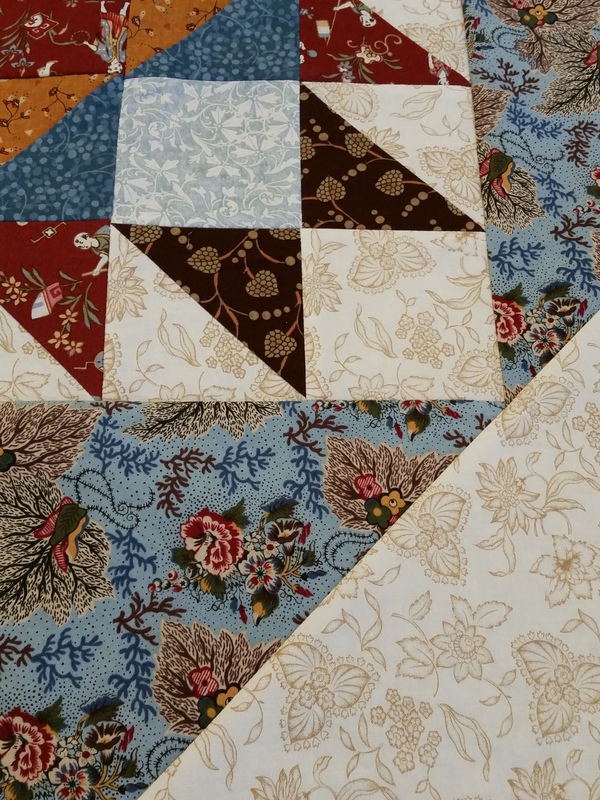 Most quilt blocks are square, or are rectangular with length twice the width, like flying geese blocks. I typically divide a border length into a number of equal increments to find how many blocks could fit along the edge. For example, if I put a block border directly along the 36″ center, I would divide 36 in various ways to get possibilities. Let’s start with whole inches. 36/18 = 2. I could have 18 blocks measuring 2″. 36/12 = 3. I could have 12 blocks measuring 3″. 36/9 = 4. I could have 9 blocks measuring 4″. 36/6 = 6. I could have 6 blocks measuring 6″. 36/8 = 4.5. I could have 8 blocks measuring 4.5″. 36/24 = 1.5. I could have 24 blocks measuring 1.5″. You can see there are actually infinite variations, though I like to stick to the ones that are easy to construct. 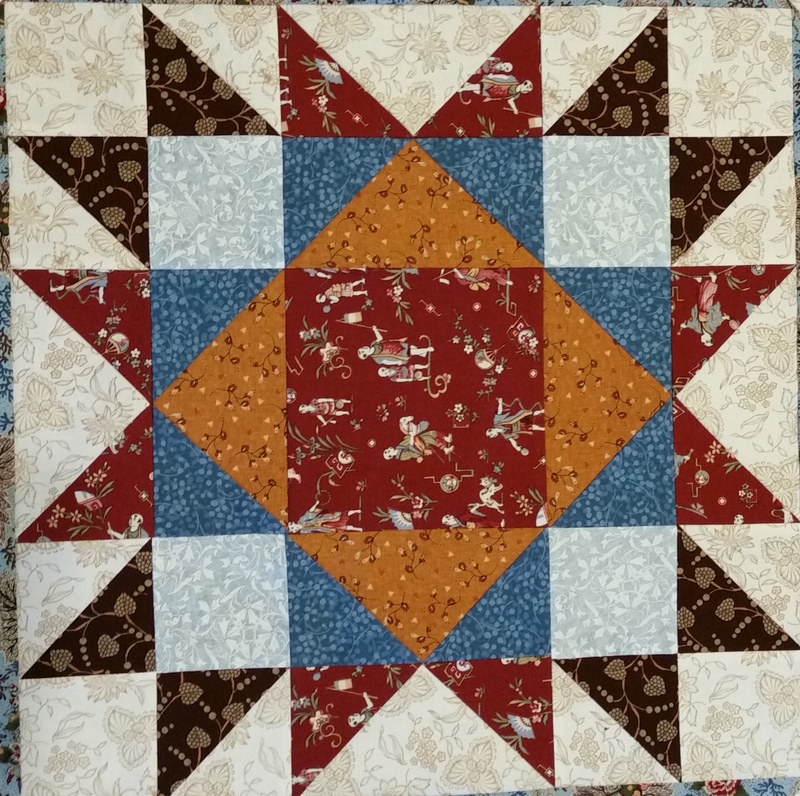 But I didn’t want to put a block border directly against the large center. I wanted the hard line of a narrow border before anything else, to contain the pale toile. That gave me 38″, which is harder to divide nicely than 36″. 38/19 = 2. I could have 19 blocks measuring 2″, but this was too narrow to work well with the proportions of the center. And 19 is a prime number, so I couldn’t subdivide it into whole numbers. 38/8 = 4.75. Sure… This actually would work fine with something like HST or hourglasses. My go-to blocks are half-square triangles and hourglasses. I don’t want this quilt to look like others I’ve made, so it’s good to try something different. Then I had a thought, a math thought! What if I divide 38 by 1.414? (That actually was the first thought. Then I thought…) If I turn blocks on point rather than set them straight, I would need to know the number of blocks using the math for the diagonal. 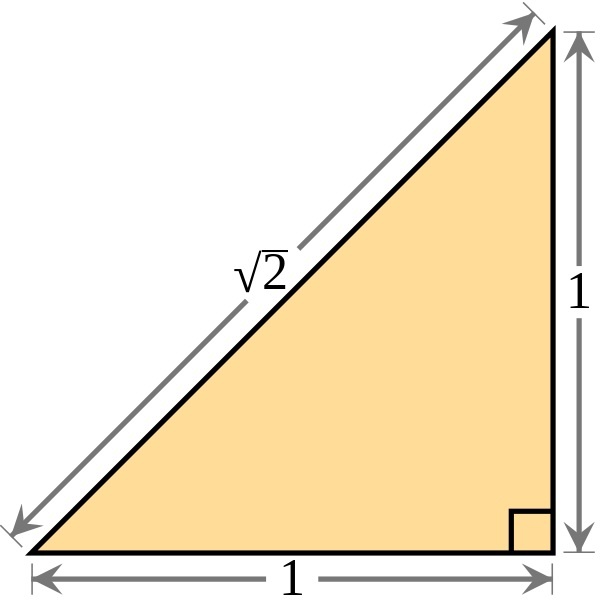 In the case to the left, a = 1; b = 1; c is the square root of 2, or 1.414. 3 x 1.414 = 4.242, the diagonal of a 3″ square, and the width of a 3″ block when turned on point. 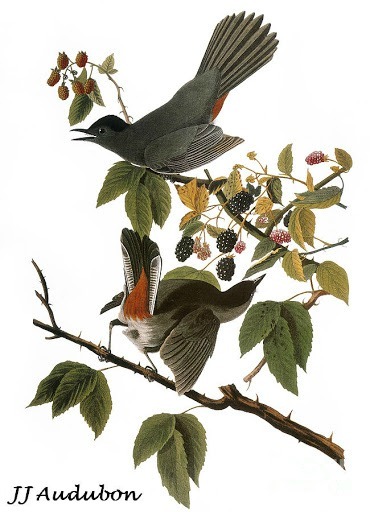 4.242 x 9 = 38.178, or very close to 38″. So if I use 9 3″ blocks turned on point, I’ll have the length needed for a 38″ border. 25.452″ x 1.414 = 36″. 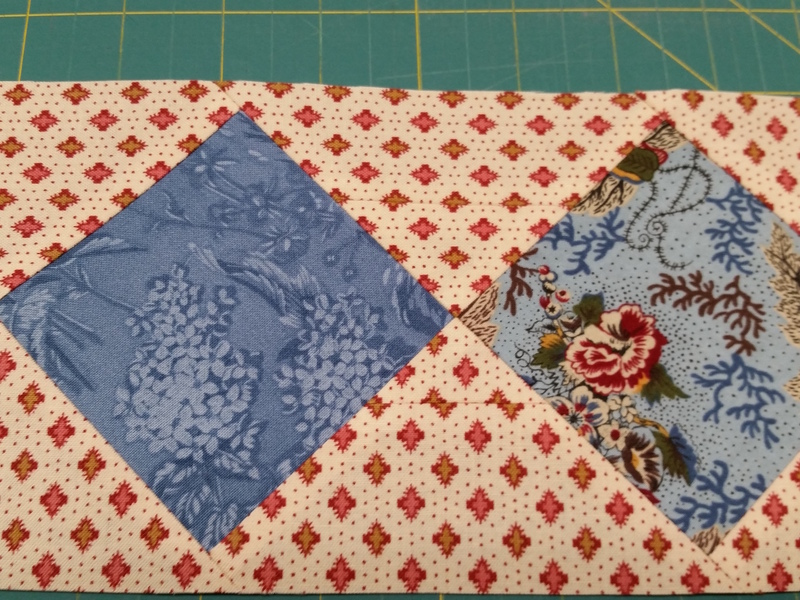 I chose to use the historical print and other blue scraps as the 3″ finish squares. For the background fabric, a light background would give good value contrast for the blues so they stand out well. I picked a pink and tan print on pale cream. The pink works because the reds have a pink cast. Right now I’m still working completely from stash and scraps. I was able to cut most of the setting triangles from a couple of larger pieces, but for the last few I had to sew scraps together to cut patches. Can you find the seams where the setting fabric scraps had to be sewn together? 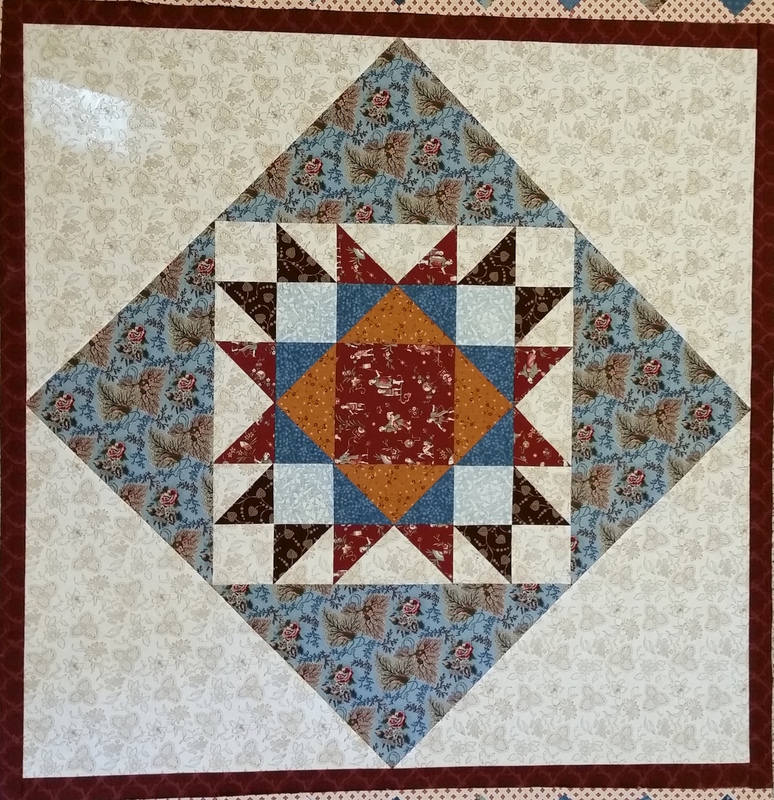 With the on-point border added, my current center is 46.5″ finished, another weird number. I plan to add an unpieced strip next, but I haven’t decided its width. I could add a strip to take it to 48″, 49″, 50″… So the next design decision, really, is the border after that, which will determine the width of the strip. I feel really fortunate to have the math skills as part of my craft toolbox. 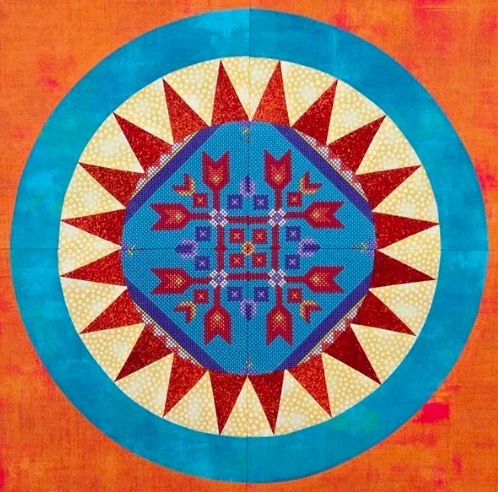 You can make beautiful quilts without knowing how to do any of this, but knowing increases the options open to me. Math is awesome! 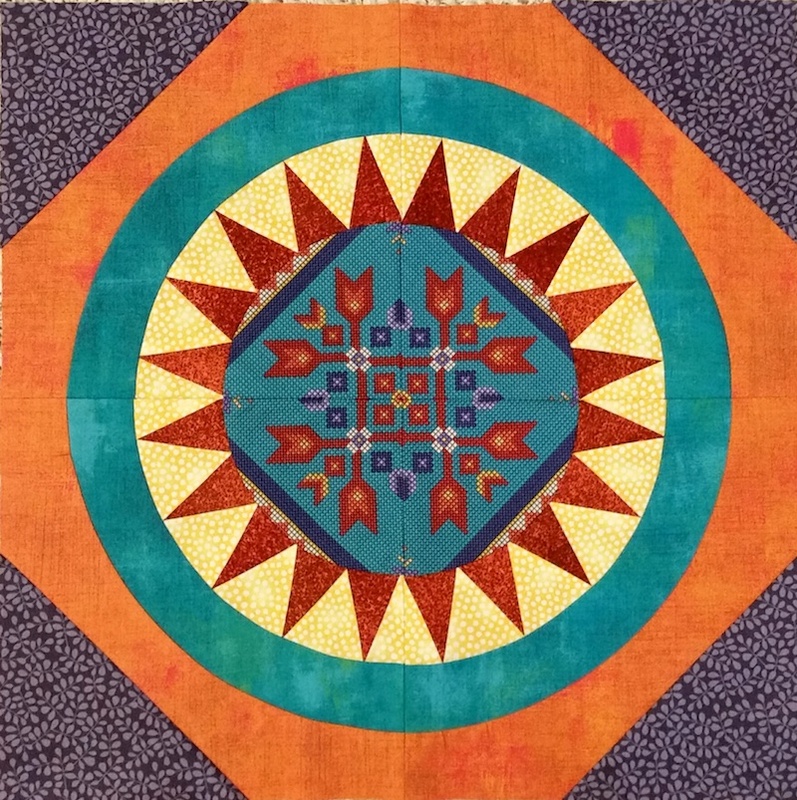 This entry was posted in Medallion Quilts, Quilting and tagged Process, Pythagorean theorem, Quilt math, Scraps, Solving problems, Stash, Work in process on April 1, 2016 by Melanie McNeil.